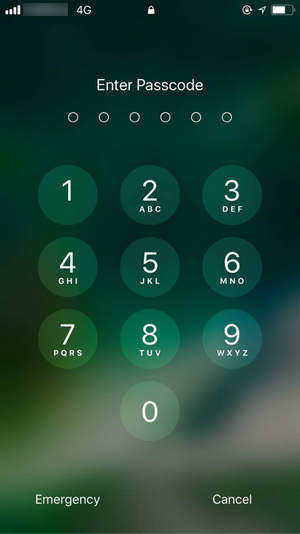 iPhones are very smart and advanced devices, and these devices are all protected by passcodes. But due to certain mishaps or update or downgrade, you can get locked out of your own iPhone. It is not very unusual, a lot of people are affected by this and you are just one of them. Just like one of my friend told me that she don't know how to factory reset iPhone 6 without passcode. When you put the wrong passcode repeatedly or simply got stuck during an iOS update, the security protocol placed by Apple gets activated. It was designed so that your data does not get accessed by any third person. So, when you are locked out of your iPhone, the best course action is to factory reset iPhone iOS 12 without passcode. 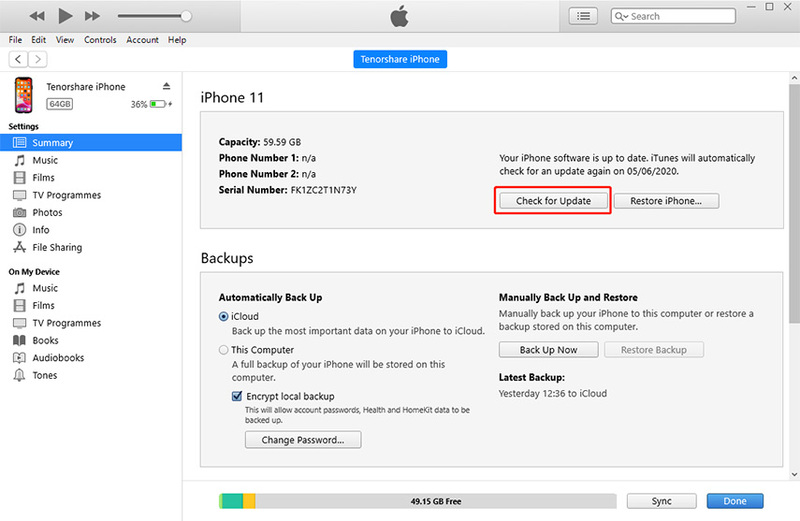 Below we have discussed a few procedures to Factory Reset your iPhone; you can follow them to get of the situation. So, to fix the lock problem of your device and in order to make it usable again, you need to erase the device completely. This will gain you the access that you lost previously but you will lose all of your data and settings. You can do this procedure with iTunes but it will be better and much easier if you Factory Reset iOS 12 iPhone without passcode or iTunes. The software that can help you with this is none other than Tenorshare 4uKey. It is a software that is capable of unlocking your device if it gets locked out while erasing your device in the process. Step 1: First, you need to download the software on your computer. Step 2: Then, you will be able to install it and then run the program on your computer. Step 3: You have to get a lightning cable and connect the locked iPhone and computer together. Step 4: After the detection of the device, you can go to the main interface of the software and click "Start" to begin. Step 5: Then, you will be asked for a firmware package that you will need to download. So, just click on "Download" to proceed. Step 6: After it is downloaded you can click on "Unlock Now" and the firmware will start erasing your device including the present passcode. So, this way you will be able to completely erase your iPhone in just a few steps without taking any risks. But after the process is completed you will have a completely new device and fully unlocked in your hands. So you better store a backup somewhere otherwise you will be in a big problem. We just discussed the way to factory reset iPhone without passcode using a third-party software called Tenorshare 4uKey; it is very convenient and effective. But as an iOS user, you must be informed about the official way to Factory Reset your iPhone and that is by using the iTunes app. But whenever you try to connect or factory reset your locked iPhone with iTunes, it will pop up a message saying enter the passcode before proceeding. So, there is a trick to get over this! Step 1: First, make sure that you are using the latest version of the iTunes app on your computer. You can use Mac or PC; it does not matter as long as you are using the proper software. Tap Volume Up button and then Volume Down button in quick succession. Then you have to press and keep holding the Side button until you see the Connect to iTunes screen. Turn off the device and connect to iTunes. Press and hold Volume Down switch and the Power button. Then leave after you see the Connect to iTunes screen. Similarly, connect to iTunes first. After the connection , press and keep holding the Home button and power button. You can leave the Home switch when you see Connect to iTunes screen. This is how you can get your iPhone models straight to recovery mode while simultaneously connecting to iTunes. Step 2: As soon as iTunes detects your device, you will see "There is a problem with iPhone that requires it to be updated or restored" alert message. Here click on "Restore". Step 3: Again iTunes will verify if you want to factory reset your iPhone and do you agree to lose all your data and settings. Tap "Restore and Update" here and iTunes will wipe out your device and start downloading the new software. This is the official way to Factory Reset your iPhone using the iTunes app. It is an effective procedure to reset your iPhone if it is locked but the whole process is a bit cumbersome and complicated. 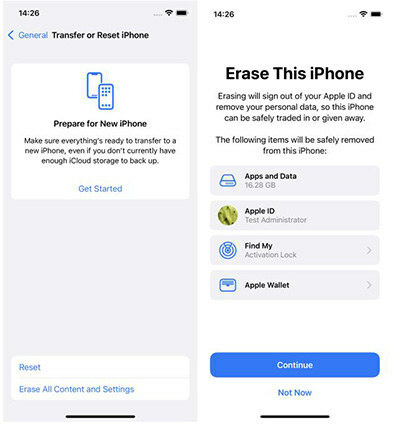 Now, before going guns-blazing to wipe your iPhone you should know that the result of this procedure will be permanent and after that, there will not be any single trace of your files and settings. So, remembering that you are going to use the iCloud app to securely delete all the files from your iPhone. This procedure was developed by Apple as a part of its security protocol. If your device gets stolen then you will be able to erase the iPhone remotely by using Find My iPhone feature of iCloud so that the sensitive data on your phone does not fall in the wrong hands. Step 1: The very first thing you should know about the procedure is that you will be using a different device to erase the iPhone. You can use any iOS device or just your computer to do it. Step 2: So, you need to open that device and go to iCloud.com. Step3: Use your dedicated Apple and password to log-in to your iCloud account. Step 4: Now, in your account, you need to click on "Find My iPhone", and then go to "Devices". A drop list will be opened and you have to select the device you want to erase. Step 5: Now, click on the blue icon next to the name of the device and choose "Erase iPhone". After you click on that option your iOS device will be wiped completely. This is a very simple and satisfactory procedure that protects your data from an unwanted third-party by erasing them completely and with that; you can have a fully unlocked device as well. Well, if your goal is to Factory Reset the iPhone or just to erase the device for security reasons, your data will definitely get lost. So, we recommend that you start making regular backups of your device immediately in case of such devastating circumstances. All the procedures to erase your iPhone are completely valid and efficient. They will effectively erase all of your files without you needing the passcode of your device. But in our opinion, the best and the easiest way is to use Tenorshare 4uKey. We highly recommend it only because of its ease of use when compared to other methods here. Go for it!